Martha's radio show "Martha Live," which aired on Sirius XM satellite radio, was recently cancelled by the station. The live call-in show debuted two years ago and was originally a daily program that broadcast for two hours, but was cut back to just one hour per week. (Martha's original satellite radio channel on Sirius XM, called Martha Stewart Living Radio, was cancelled several years ago.) 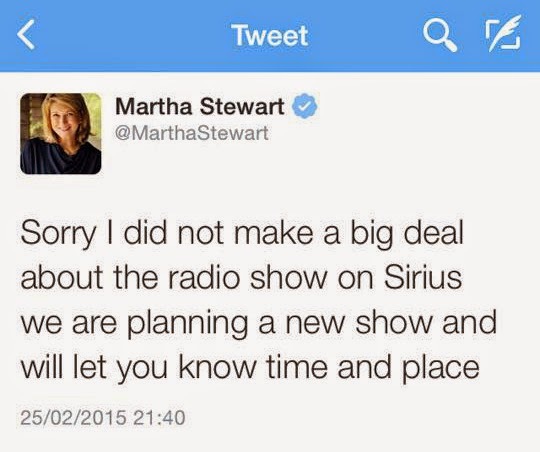 Quickly as the news came, however, Martha announced on Twitter yesterday that they are working on a new radio show. Details have not yet been made public, so stay tuned for updates! Since digital TV arrived in the US many "secondary" stations have appeared . Some with repeats of old sitcoms , movies, and new cooking/lifestyle shows. Even better then attempting to start another radio show, the original MSL show would be a welcom addition to theses stations and will show Martha at her best . I wish MSOL would concentrate on packaging/selling these quality shows! I agree. There needs to be a substantial forum for the broadcasting of her older TV content; not just the web. However, I think radio is a very nice way to feature new guests, new experts, co-hosts, etc. I'm wondering if perhaps the new radio partner will be NPR? It seems like a good fit with her PBS TV programming. Type of show. But I do agree NPR would be an excellent match . It would be fantastic if the original Martha Stewart shows would be rerun. There are many young people who have never had the chance to learn so many things that some of the rest of us consider just plain common sense. It would be just a great idea. Anything on a new show yet?